There have been many interesting articles about language use related to the 2012 presidential election in the U.S. Some of my favorites include this recent one on the ‘mass-nounification of vote’ by Ben Zimmer and this one on the use of the phrase ‘razor tight’ by Arnold Zwicky – which has also been noted by Steven Colbert among others. There have been plenty of note-worthy instances of English usage in the 2012 election cycle in the U.S. – as this N.Y. Times article, which was mentioned on the blog yesterday, demonstrates. 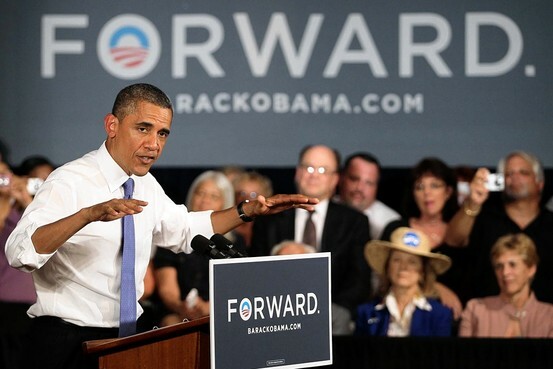 However, for me, the use of the period featured in ‘Forward.’ is special. In the past few years, I’ve noticed what seems to be an increasing proliferation of periods and pauses in informal English. I was pleased to find some cross-linguistic support for my feeling in a Dutch book by the wonderful cabaret performer and writer Paulien Cornelisse. 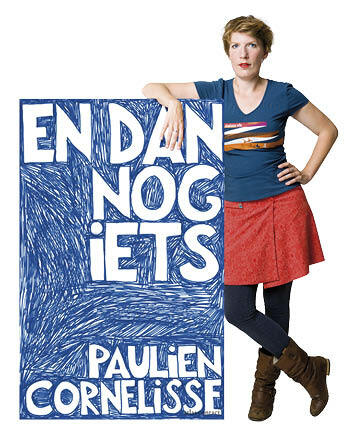 Her recent book, En Dan Nog Iets, is filled with funny insights into different aspects of everyday language use – some of which were compiled from her columns in the NRC.next, Klare Taal, and the NRC Handelsblad. Cornelisse writes at one point (pp. 44-45) about the trend she has noticed in the speech of 16-year old young women: To scatter. Pauses. Incessantly. Throughout. Their informal speech. It would be interesting to hear whether readers of this blog have also noticed this possible period/pause trend in writing or speech in English or other languages. I’d also be very pleased to receive information on language use in political campaigns outside the U.S. Specifically, I’m curious about whether the punctuation of political posters attract this degree of attention in other countries as well. The 2012 election cycle in the U.S. has been rather exhausting for many who have followed it. But, as far as I’m concerned, quotes like this one from campaign spokesman Ben LaBolt (found in the WSJ article mentioned above) make it all worthwhile: ‘Stay on your toes—anything could happen, […] Do not be surprised if we introduce a semicolon.’ A good semicolon joke can compensate for a lot. This entry was posted in news, usage features and tagged attitudes to usage, Forward., full stop, Paulien Cornelisse, pauses, period, political language, punctuation, usage. Bookmark the permalink. 6 Responses to Punctuation. In Political. Contexts. It is interesting to see that similar techniques occur in informal speech as well. Thank you! (I wonder about the extent to which these speech patterns are ‘focus-grouped’ in advance.) And perhaps it is just something of all ages. Pauses are obviously important rhetorically. However, Corneliesse contrasts the possible ‘pause trend’ in the informal speech of young women with what she’s noticed in the recent past – such as the ‘questioning intonation’ popular in the ’90s and the ‘exclamatory intonation’ popular during the ’80s. These trends are obviously not mutually exclusive – but I thought it’d be fun to hear the opinions and experiences of others on the topic. Thanks again for the article. So it is a trend! I had been wondering about the full stop in the title of my brother-in-law’s book about their stay in Ethiopia. I don’t think I can add an image here, so the link will have to do: http://assets0.blurb.com/images/uploads/catalog/85/3262485/3526629-00c09c6cea0ca8456f06c95276a27d43.jpg?20121108005037. The only thing is that he is British, not American. Cynthia! In a chatroom (though I doubt Obama spends a lot of his time there), people often use full stops at weird places or, at least, they seem weird to people who follow the ‘rules’ of where the full stop should go. When a person says something as “Word.” it’s more a type of emphasis, stressing your agreement with what has been said before. The full stop is not meant as a stop at all. When I came across it while reading loads of conversations in chatrooms, I thought it meant more like a “This is what it is and (in the words of the Borg[star trek]) resistance is futile”. 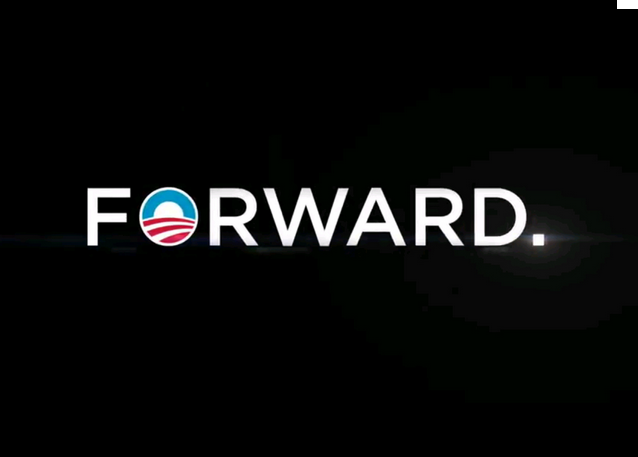 In terms of, “Forward.” that would mean that it is just that, Forward and nothing else. But this is,of course, my interpretation of what I found! And another comment: one of my colleagues sends me emails which have full stops in the subject header, which I find very unusual. I can’t reproduce any examples for reasons of privacy, but they don’t seem emphatic to me. I’ll ask him why he does it though next time I get another one.